After a hot day at the beach, I had a sudden craving for hot pot. I don’t know why. 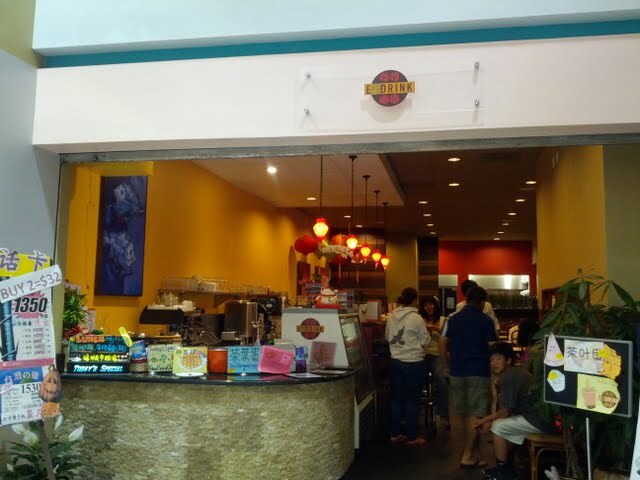 We decided to visit E & Drink again, also giving me an excuse to try out the egg waffles now offered which I had spied in a picture from Pink Candles at Ridgemont High’s post. Since its opening, business has been pretty steady. It seems to be the most popular restaurant inside Ranch 99. While I don’t think it’s the best place for individual Taiwan hot pots (the Boiling Point chain in LA is better in my opinion), it’s the only one around in San Diego so I can understand why customers flock to it. Upon entering, we were greeted warmly by the staff who are dressed in all-white. It must be a pain to have to dress in all white when working around food. 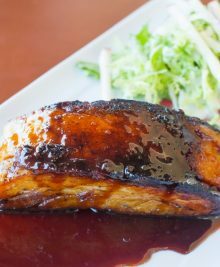 During lunch, a choice of sweet black or green tea comes with the meal. 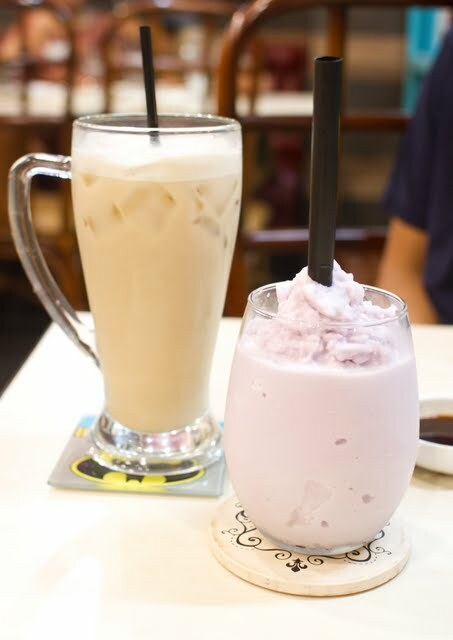 Since we were dining for dinner this time with no free drink, we decided to try some drinks from their long drink menu. They really love to use the oversized beer mugs here. 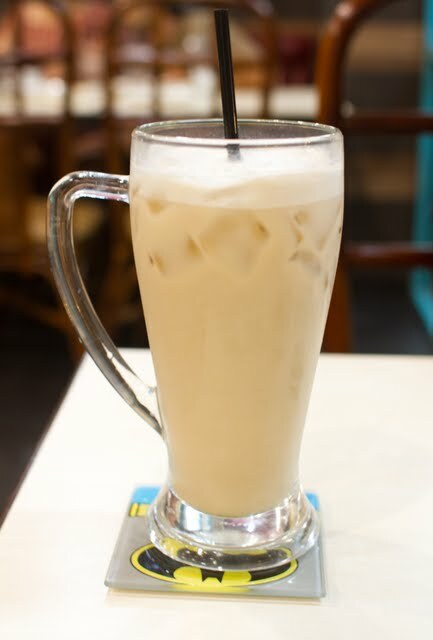 It does remind me of the cafes in Taiwan though. DH was excited by the Batman coaster. 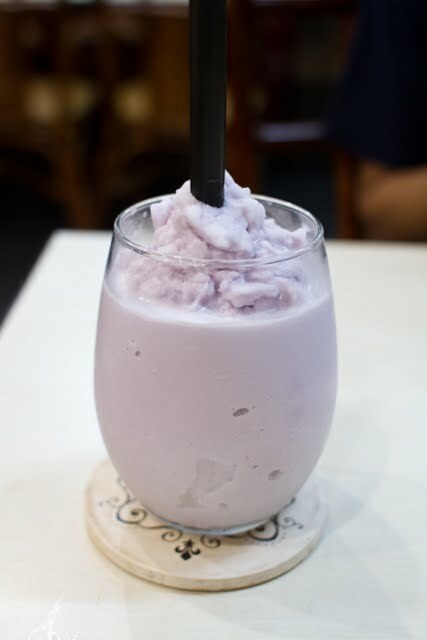 I couldn’t really tell that ice cream was used as opposed to just a regular taro powder slushie. DH opted for the spicy beef, and requested only “tiny spicy.” There was a good amount of ingredients in his pot, including beef slices, tofu, napa cabbage and beef balls. The broth also contained actual pieces of beef stew meat as well. 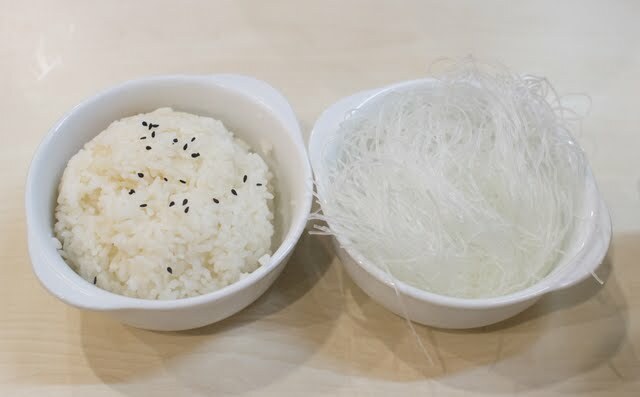 At the bottom were clear vermicelli noodles. I really think they should rename this one. I knew what it was going in because of the chinese characters, but I still sort of thought that it wouldn’t just be the traditional soup and instead would have hot pot ingredients. No such luck. I think this one should be named Medicinal Chicken Soup so people don’t mistakenly order it. 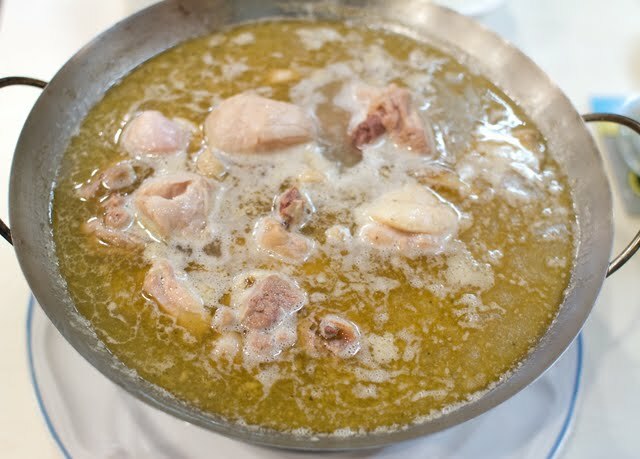 麻油雞 (pronounced Ma Yu Ji), is a Sesame Oil Wine Chicken Soup that is made with a special kind of rice wine, chicken, sesame oil and ginger. 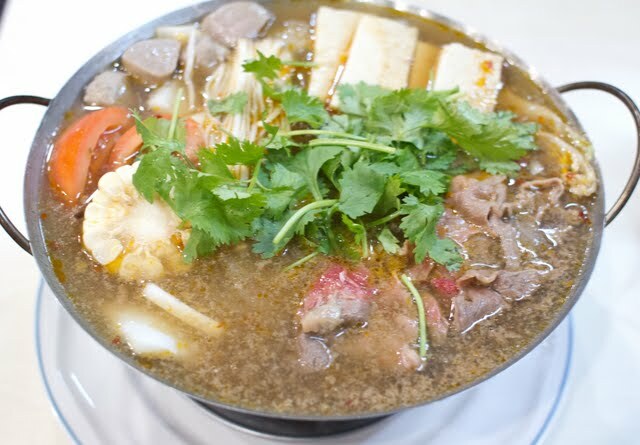 It’s an acquired taste, as you can definitely taste the alcohol in the broth and it’s very heavy. It’s supposed to improve the health and is most often cooked for women when recovering from childbirth, though it’s used a general health remedy as well. My mom makes it often in the winter. 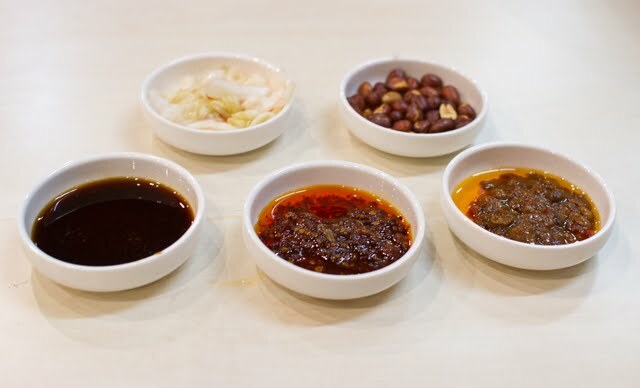 I thought it was strange to serve it as a hot pot when there are no hot pot ingredients accompanying it and it is priced the same as all the other broths. I also didn’t think their version was that great. It was a little too light on the wine. For dessert, we had to get the Egg Waffle. 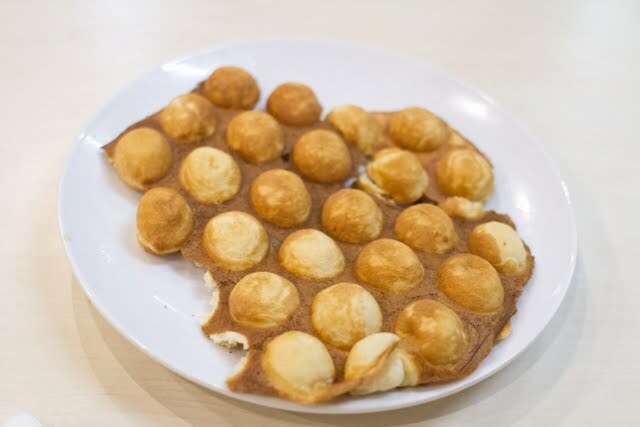 Egg waffle is a Hong Kong dessert. 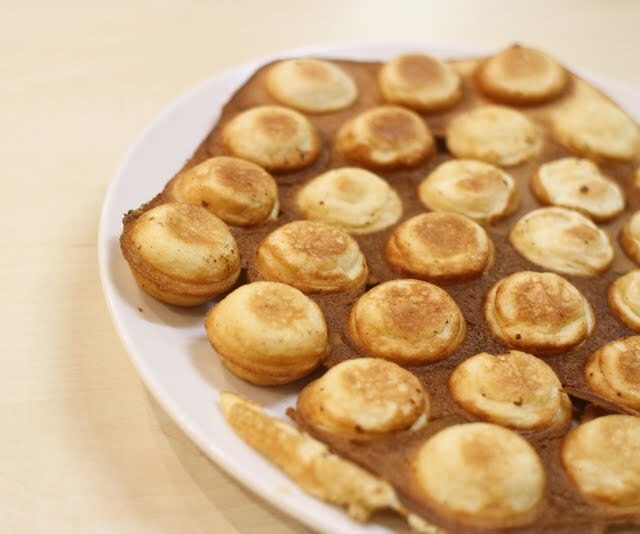 Pancake-like batter is baked in a special egg waffle iron. What comes out is a crispy, fluffy sweet treat. If you’ve ever tasted sweet chinese eggroll cookies, the flavor is similar. 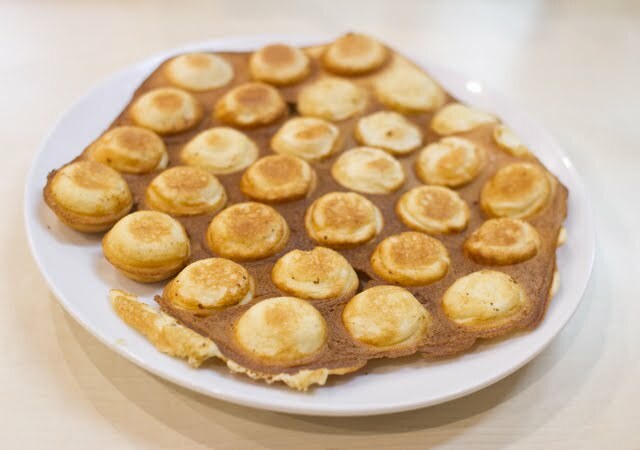 The egg waffle iron creates a pattern where individual egg-shaped puffs are connected together by a thin layer of crispy batter. I love eating it, and it’s really fun to pull apart with your hands. It’s been a long time since I’ve had it, so I was excited to see it on the menu. It took them a little while to make and when it came out, i thought it looked a little flat. After we dug in, I realized they had presented the flatter bottom side to us. A flip over and you can see the puffy egg shapes better. The version here was just okay. The egg puffs were not crispy enough and were a little too soft. But it was still fun to indulge in one of my favorite desserts. Though after having it here, I really wanted to buy an egg waffle iron so I can just experiment with making my own. I’ve seen this one by Nordicware sold exclusively at William Sonoma. At the time I first saw it, I balked at the price. But a quick search on ebay shows the other brands costing almost as much. So now I’m tempted to “invest’ in one. This place is starting to grow on me. The staff is also pretty friendly though they appear to be very disorganized or maybe it’s lack of experience. They have quite a few servers in the dining area, but they always seem a little lost and uncoordinated. Hopefully this will improve in time. You can read my first visit here. yay! you went and tried those egg waffles! did they only have one flavor? you commented on the post because you wanted one of those egg waffle irons. Yes only one flavor. I’ve never tried other flavors before. I remember this old post! The pictures show how they should look. Much crisper and shinier. The ones at E & Drink aren’t nearly as good, but I probably would still get it again, until I finally get my own pan. I actually already just bought one. I couldn’t resist! I am waiting for it to ship. William Sonoma sells a batter mix. I bought that, but I will also be bookmarking other recipes and can’t wait to try out different flavors. Did they refill your hot pot at all when you were there? I went there few weeks ago w/ friend after reading your post and I liked it 🙂 I thought their HK curry hot pot was pretty good. But yeah – I’ve been craving hot pot during this weird hot humid weather. My sis and friends think I’m crazy. I think I saw them give broth refills to those who requested it. i didn’t have need or request one though. No, it’s a different tasting batter. I have the takoyaki maker =) I bought it somewhere, either on Amazon or at marukai living. can’t remember which one. It was about $20. Wow! Those egg waffles look delish! When did you visit this resto? I so love soup and hot pots. This might be a great place for me and my hubby. Do you remember how much the egg waffle was at the restaurant? I bought the same pan at the William Sonoma Outlet. When it was sold online, it was super expensive. Luckily, I found it at the outlet about a year after it came out and it costs half the regular retail price. Have fun with the pan and I look forward to reading your batter recipes. I believe it was $3.99. I can’t wait until mine arrives!